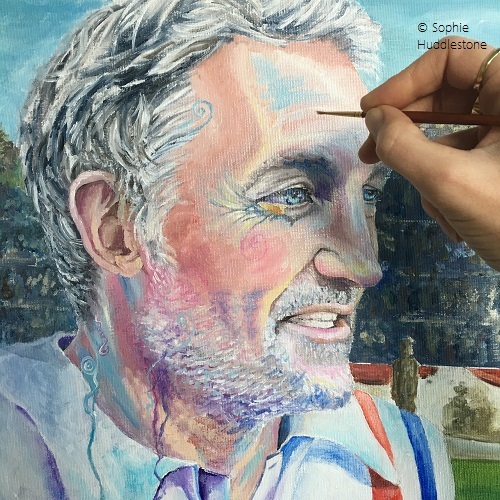 Welcome to Sophie Huddlestone’s website, a U.K. artist specialising in watercolours and expanding into oil paintings and mixed media. Painting is my oxygen, I don’t think I could survive without a paintbrush in hand. Even on our annual holiday the paintbrush is the first thing packed. My art studio is filled with beach themed items to re-create that holiday feeling. The comfort zone for me is definitely sploshing about with paint at my Leicestershire seaside. 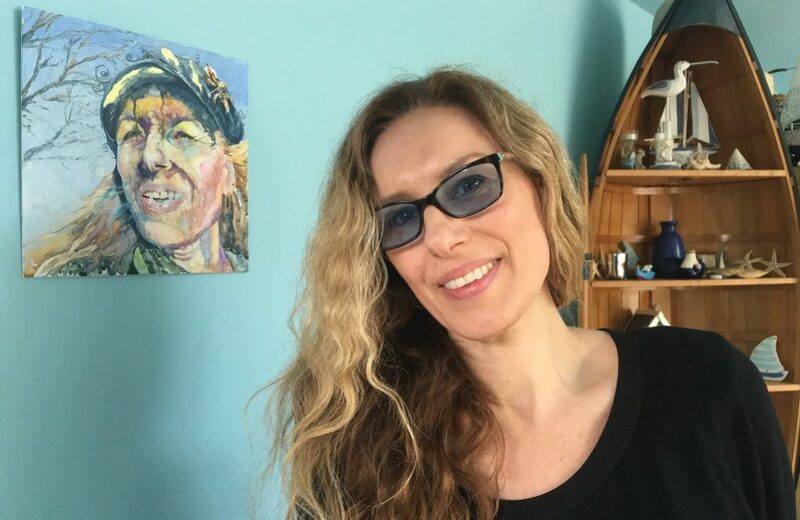 “If the unspoken rules of how a painting should look were contained in a bottle, then I’m going to shake it, twist the lid, and let creativity burst out of my swirly brain regardless of the consequences” Sophie Huddlestone. An interest in art began at 11 years of age with complex themes that were not your typical house, tree and rainbow. I was in ore of Salvador Dali and would daydream in his pictures for hours. The encouragement for my art at an early age was fantastic but it was mainly when I painted something sweet. In 2011 I picked up my paintbrush and the urge to create came back full throttle. Twirling brush stokes and adding a tiny hidden smile face in the swirls of ink soon became my trade mark style. I had two strings to my bow with contemporary animals and a surrealism streak, but the flowing ideas for the ‘weird’ artworks remained bottled up. I began to use my married name of Huddlestone in 2018 and dared to include the more unusual art works combined with portraiture. The current narratives of which are are based on the complexity of hidden human emotions, adding messages within the art, aspects of past & present or things which will be very different in generations to come. If a painting speaks to you and draws you in for a longer gaze, perhaps your subconscious has already deciphered a connection with it. 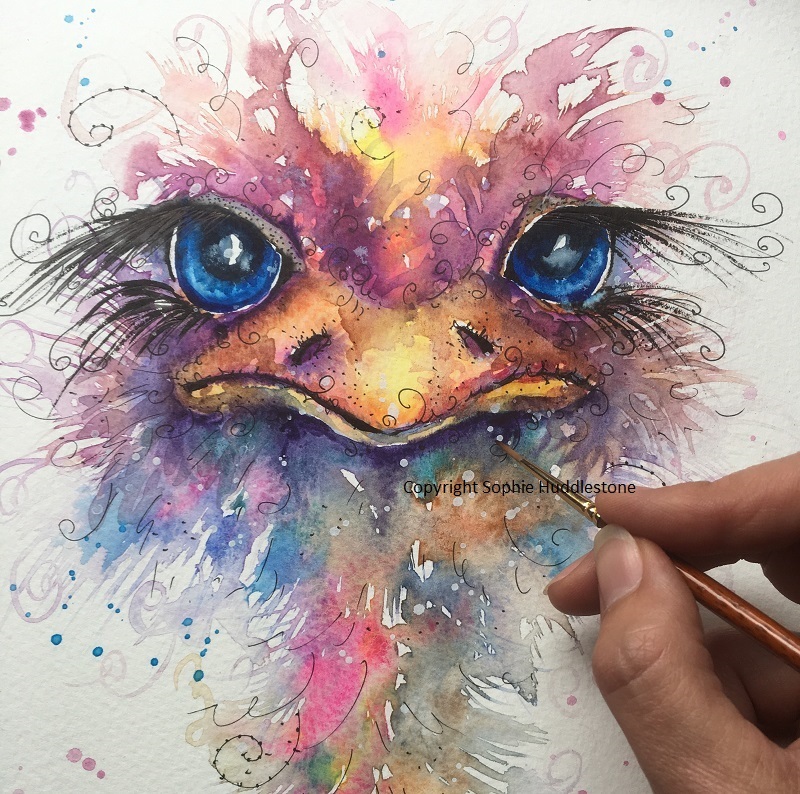 I often paint animal, bird and flower commissions but was a little nervous when asked to create my first portrait commission this March. It was for Russell Osman – he acted in the film Escape to Victory, Indian Super league football expert, TV Co-commentator, former footballer for England etc. 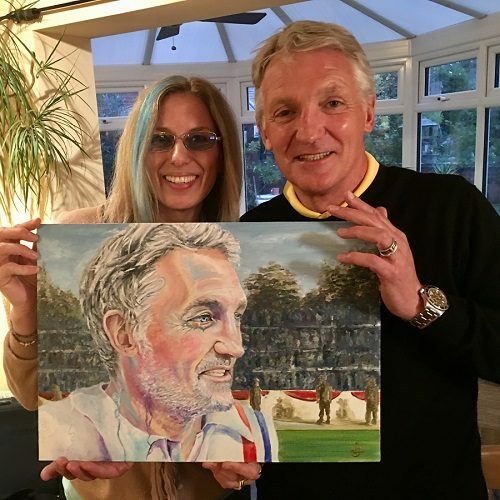 and I was thrilled when he displayed my portrait on his Instagram @russosman and his Twitter @RussellOs5 Given free reign to create the portrait with any theme I decided to combine his past film as the background, the England colours in the shirt he wore for the film and painting him as he looks today, plus some of my signature style swirly squiggles. To my relief he thought it was wonderful. Want to get an answer to a question quickly? Messenger me @SwirlySophArt (Artist Sophie Appleton Huddlestone). All contact details are on the main menu above on the contact page. Examples of more informational pages on this website are below. Thanks for visiting my website, let the swirly adventure begin. 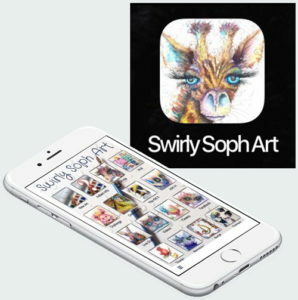 Try Sophie Huddlestone’s Artists app: it is called ‘Swirly Soph Art‘ available for free on the App Store and Google Play. 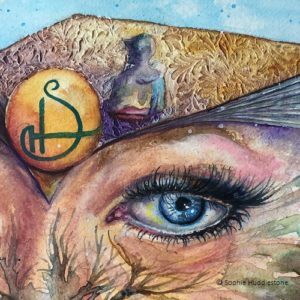 It has my new art on a live feed, occasional quiz competitions, live chat, your art on display, discount codes etc. It is for hobbyist artists and new & returning customers. App users can join in and interact or simply view the artworks. On a tablet search for it in the list of ‘phone’ apps.